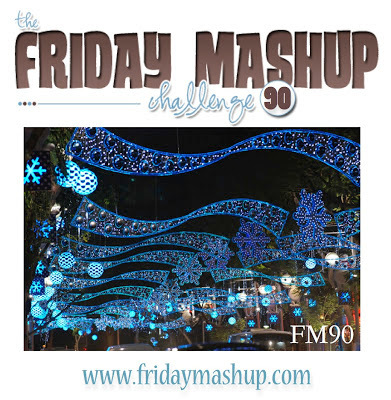 Krafting Kreations: Winter Snowflakes Friday Mashup 90! Okay, I’m really late posting this. It should have gone up last Friday. But since I had the last week off from work I was in complete vacation mode and didn’t think about the blog at all. Sorry! It was nice to get to relax though. So…better late than never here is the card that I made for the FM20 challenge! Make a project using "Snowflakes". Or Make a project with the colors "Whisper White, Pool Party, Midnight Muse, and Basic Black". Or "Mash it Up" and create a "Snowflake Project with the colors Whisper White, Pool Party, Midnight Muse, and Basic Black". This one was fast and easy to put together! I started off with a piece of Midnight Muse card stock cut at 5-1/2” x 8-1/2” and scored at 5-1/2”. I stamped the Bold Snowflake image all over the card front in Illuminate Versamark. This gives a nice shimmery snowflake background. Next I cut a piece of Whisper White card stock 2-7/8” x 3-7/8”. I stamped the snowflake from Snowflake Soiree onto the card stock in Pool Party ink several times. Then I stamped the greeting from Sincere Salutations in Midnight Muse ink in the lower right hand corner of the card stock. Next I adhered the stamped Whisper White panel onto a 3” x 4” piece of Basic Black card stock. I used some SNAIL Adhesive to adhere a piece of 5/8” Basic Black Satin Ribbon (retired) around the panel. Next I took a piece of Silver Glimmer Paper and cut out the medium snowflake on the Snow Flurry Die in the Big Shot. I placed the snowflake on top of my Whisper White/Basic Black panel then used my Paper Piercer and Stampin’ Pierce Mat to pierce a hole in the snowflake and the panel. I used a Pool Party In Color Designer Brad to attach the snowflake to the panel. Then I simply adhered the panel onto the card front with Stampin’ Dimensionals.